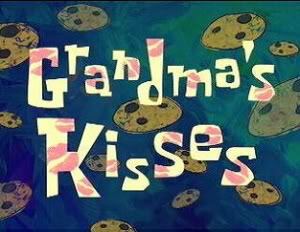 Grandma's Kisses (Episode) – From SpongePedia, the biggest SpongeBob-wiki in the world! SpongeBob goes to his Grandma's house to get treated like a baby. They do lots of baby things together until it is time for work. So they drive to work and Grandma gives SpongeBob a kiss but everyone in the Krusty Krab sees. He then gets teased and he is upset and goes home. Patrick then comes to SpongeBob's House and asks whats wrong. He finds out then helps him and they go to Grandma's house. They are ther with Patrick and SpongeBob starts acting mature until he sees Patrick act like a baby. This makes SpongeBob jealous and he gets sad but he does not show it. After he had been there for a while he had to head back off to work.. But when walking toward the door and starting to leave, he runs right back and what he starts to do is hiccup in Grandma's house! He says that he doesn't want to grow up. He wants to become a baby again and do all the stuff he did when he was treated like a kid! Then, Grandma says he doesn't have to be a kid to get Grandma's love. Then, she gives him a cookie and hugs him. The people at the Krusty Krab are watching Grandma hug him and start laughing. Just after SpongeBob cries a river in Grandma's house, she tells him that he does not have to be a kid to get Grandma's love. When SpongeBob adds, "I don't?" his lips in the water reflection do not move. When SpongeBob is crying, Patrick vanishes. How did Squidward and everyone else find Grandma's house? This page was last modified on 15 August 2010, at 08:44. This page has been accessed 17,866 times.